During a trip to Crownpointe, New Mexico several years ago I visited a ruin that I believe was called "Tall House." In my memory it was called tall house because it was the first two-story house in North America. I am now questioning my memory because when I did a search for "Tall House" I came up pretty empty. I say pretty empty because apparently "Tall House" - the name - was used a lot in reference to Indian ruins - and this one is relatively small in comparison to some of the other "Tall Houses" out there. 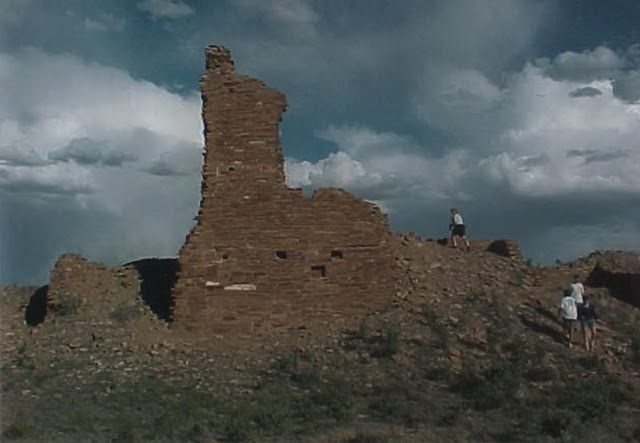 Specifically, there is a large area in Arizona, a ruin from the Hopi Tribe that gets most of the press under this name. 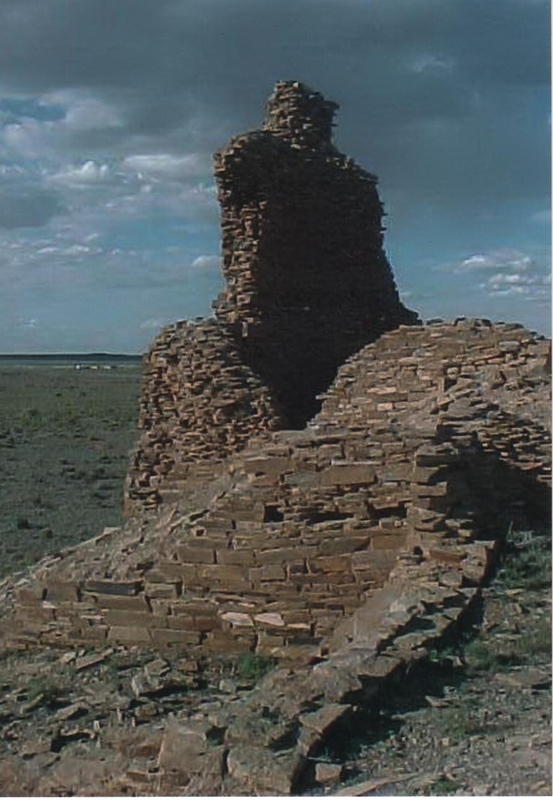 The Hopi tribe was originally located in northwestern NM and northeastern AZ, but the Navajo Nation now holds the land where this particular landmark sits. So I am deducing that this is a Hopi landmark and go from there. A little bit away from this house you find the dumping grounds for all of the discards of the inhabitants everyday life - an old fashioned land fill I guess. In this area it is legal to pick up and keep any of the trash that catches your eye. 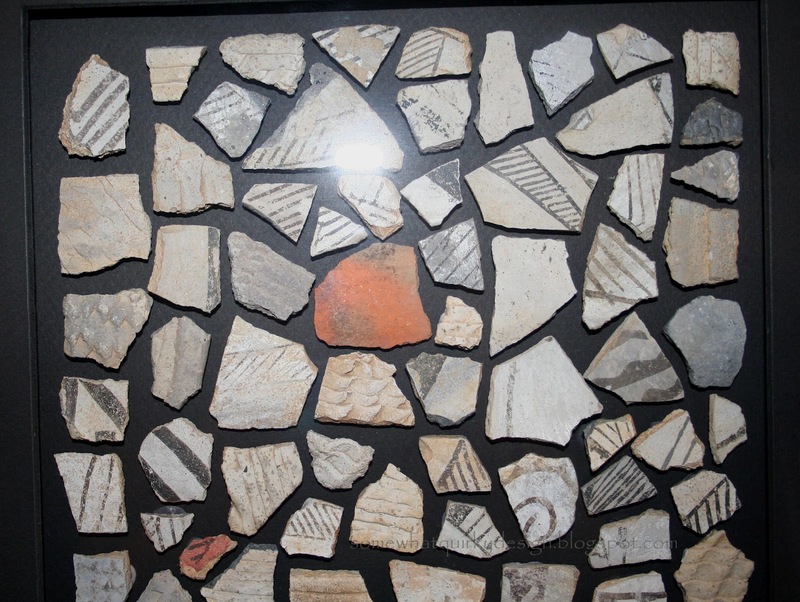 I'm not an anthropologist or archeologist so the only recognizable remaining "trash" here are pottery shards and and occasional teeny tiny bit of turquoise or other stone used for ornamentation. 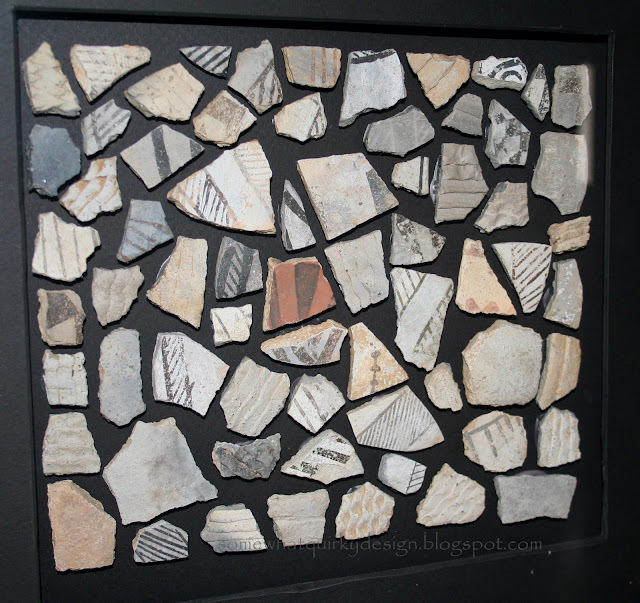 Of course I collected my share of pottery pieces and brought them home. 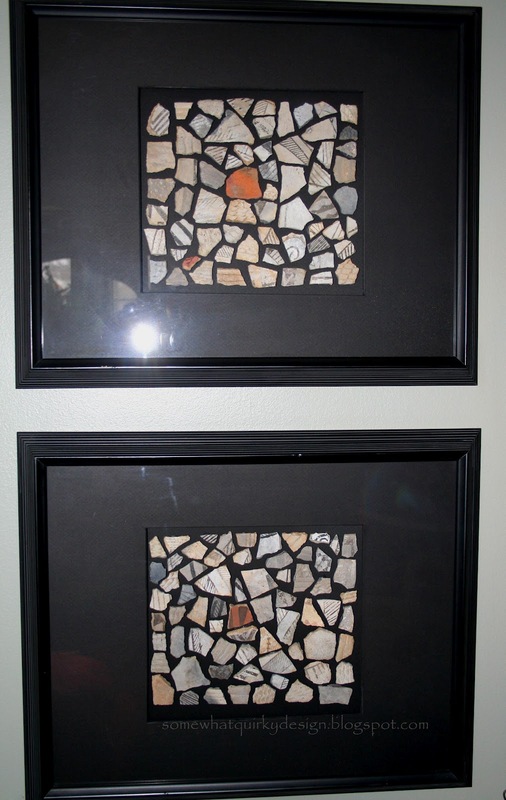 I thought they were beautiful - the texture and colors (or lack thereof) - so I made something out of them. They remain some of my favorite art to this day. The red pieces are very rare in this dumping ground. The Hopi did not make red pottery - this means that these pieces were from pottery that was a gift or traded for. Cut a piece of black core matting to the finished size of the art and cut the inside to the size of the display area that I wanted. Pretty easy. If you look closely you can see where the glue is showing. I just accidentally stumbled upon these frames in the discount pile at Michaels or these pottery shards would probably be sitting in a bowl on a table. I call finding them a pretty dang happy accident because the finished product makes me very happy and reminds me not only of the trip itself, but of the rich heritage of those who came before me in this world. What a fun project, I'd never thought of doing something like that - I have sea glass from a family trip that I can display like this. Thanks! New linky follower too!